View cart “China History – Pre-history” has been added to your cart. 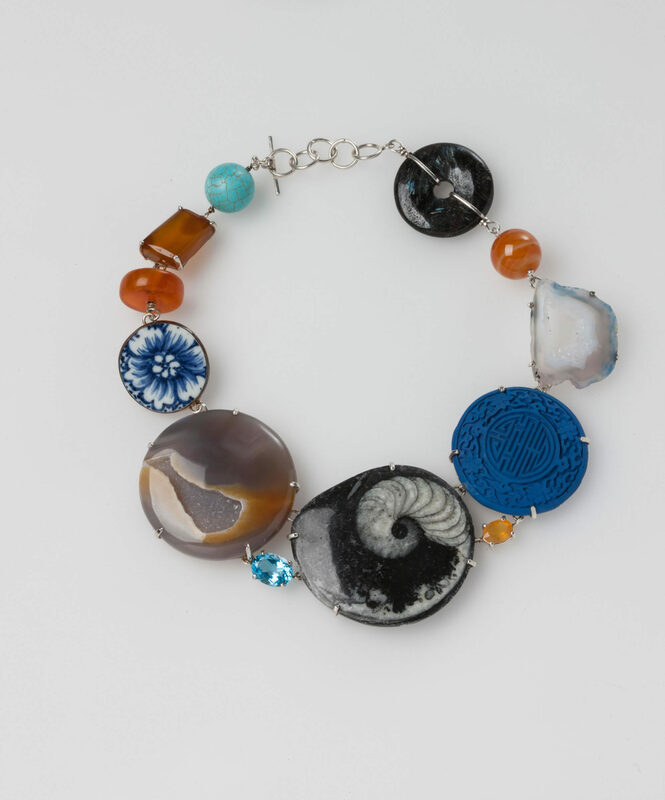 This stunning necklace is constructed of beautiful black & grey ammonite fossil, a gorgeous piece of polished caramel & grey agate with druzy crystal ‘window’ highlighted with faceted oval blue topaz, and Mexican fire opal, blue Chinese lacquer medallion, blue and white Chinese porcelain disc, druzy agate, large orange carnelian bead, African amber & ochre chalcedony, blue howlite bead and labradorite ring. 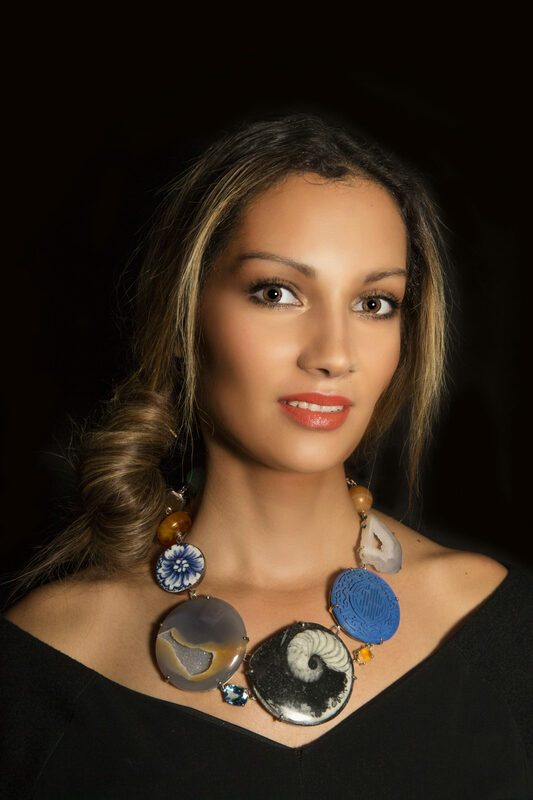 This necklace refers to the origins of the world. Ammonites lived at a period of time far earlier than ours and swam in oceans from China – around the entirety of the earth. Cut stone and worked metal is a reference to “culture’. It is a beautiful attention-seeking piece that works effortlessly from day to night and night to day. This necklace refers to the origins of the world. Ammonites lived at a period of time far earlier than ours and swam in oceans from China and around the entirety of the earth. Here, there is reference to the stages of development in the Prehistoric eras through the black and white ammonite fossil and historic era … and through the cultural manufacture of blue and white porcelain, blue Chinese lacquer bead that reference China specifically. China was famous for its manufacture of porcelain and blue and white wear, mainly known from the Tang Dynasty (Henan Province, 1300 – 1320). However, it has since been discovered that (with the importation of very expensive cobalt blue from Persia) blue and white wear was originally made in China much earlier … which is why porcelain is also called ‘china’. I also see ‘Ritual Binding (Bound Silver)’ necklaces as Post Modern in that I am appropriating elements from disparate time zones and countries and binding them together in one piece.